Studies indicate medication errors have risen to the 3rd leading cause of death in the US. Seniors today take anywhere between 5 to 8 medications per day, making them especially high risk for hospitalization from a medication error. Buffalo Pharmacies is doing their part to help Seniors stay healthy and out of the hospital. Buffalo, NY, February 21, 2018 --(PR.com)-- Package Case Study - Buffalo Pharmacies Addresses Medication Adherence for Seniors. Buffalo Pharmacies is doing their part to help Seniors stay healthy and out of the hospital. Studies indicate Medication Errors have risen to the 3rd leading cause of death in the US. Seniors today take anywhere between 5 to 8 medications per day, making them especially high risk for hospitalization from a medication error. Buffalo Pharmacies founder Joe Voelkl has seen many family and friends experience the lack of consistent, compassionate and reliable solutions to help people manage their medications. Buffalo Pharmacies supplies pharmaceutical medications to many of the local nursing homes, assisted living and members of the community, knowing that seniors are at great risk for medication administration errors, they offer multi-med blister card packaging that helps patients, caregivers and pharmacists manage complex medication regimens. 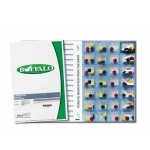 This blister pack is prepackaged with the patients medications for 1 week, allowing 4 cubes for morning medications, afternoon medications, dinner and bedtime medications. This helps patients remember to take their medications at the right time with the right ones, and right dose. Whether it’s offering free local delivery, providing home medical equipment, or compounding services, Buffalo Pharmacies focuses like a laser on providing quality pharmaceutical care to western New Yorkers - as it has for more than 50 years. The pharmacy’s personal approach extends to its packaging as well, which aims to increase patient adherence to medications. That’s especially significant for patients with multiple chronic conditions who find it difficult to manage numerous daily medications. In addition to the comingled blister packs, patients medications are synchronized regardless how many providers they see, and delivered to them at home, senior housing or assisted living. There are no additional charges for these services to the patient. Many seniors overestimate their memory while receiving instructions from the local pharmacy, Buffalo Pharmacies has a pharmacist available 24 hours a day, and SureMed cards offer a clear, concise format that is easy for patients and caregivers alike to read and comprehend. The ability to provide perforated cards offers a level of convenience for the patient that many other pharmacies do not have. The ability to simply "tear off" a dose and take that with you as opposed to taking the whole card is a big advantage. What makes the packaging especially notable is that each blister cavity may contain one or more doses of different medications, which aim to reduce potential confusion over what meds to take at what times. As printed copy on the packaging suggests, the SureMed cards are not specifically designed to be child-resistant, yet compared with a traditional pill bottle, it is apparent when a specific dose has been tampered with or is missing. The packaging does make it easier for seniors to open and take. Buffalo Pharmacies began using the SureMed cards in 2016, after looking at several multidose options. Prior to this, Buffalo Pharmacies had not committed to a single adherence package type. Today, hundreds of patients in Buffalo take advantage of the SureMed cards from Buffalo Pharmacies. 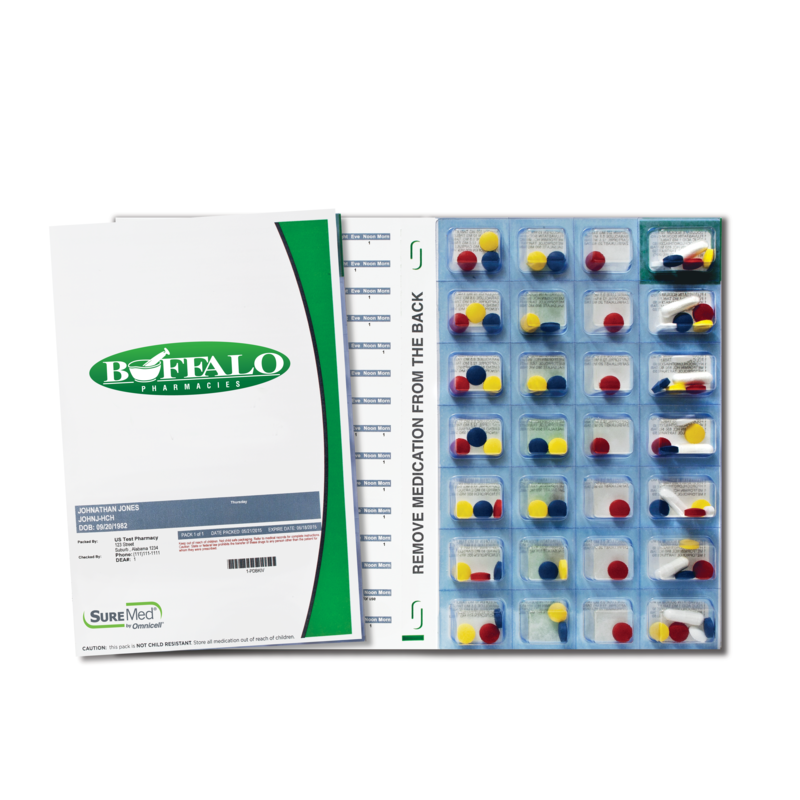 Beyond the SureMed card, Buffalo Pharmacies takes advantage of Omnicell’s guided packing software, is integral to workflow and offers real solutions to issues such as traceability and packing accuracy. With the guided packing software, we can have new employees trained on guided packing in very little time as the system basically takes a lot of the thought process out of the production of the cards. It guides the employee through each step, ensuring the card is packed properly, accurately, and is safe for the patient. It takes the human error out, resulting in accurate, effective and safer medication dispensing, verified by a pharmacist before delivery. The guided packing software also streamlines the checking process for the pharmacist, making sure every pill is checked properly and efficiently, saving valuable pharmacist time for more patient medication reviews. With the cost of medications on the rise, Buffalo Pharmacies wants to keep the baby boomers out of the hospital and enjoying the golden years. Managing their medications the right does, at the right time will significantly contribute to that goal. Innovative technology with a family touch. Medication as individualized as the patient.